The end of a quarter is always somewhat bittersweet. On one hand I get a pile of projects to grade (bitter), and on the other hand I get to enjoy the work of my students (sweet). My AP classes never fail to impress. Every quarter the receive a 9 weeks project that is to be turned in at the end of the quarter. Generally my favorite student products of the year come out of these quarterly submissions. This semester's AP Bio class has not failed to impress. Their task this semester was to choose a disease with a genetic basis and produce an awareness campaign about the disease. I must note that every product that I received is worthy of note, however, there is not room in this post for all of them so I will highlight a couple of unique offerings and point you to the Hall of Fame to see some others. First, I am a sucker for unique, eye-catching poster designs. 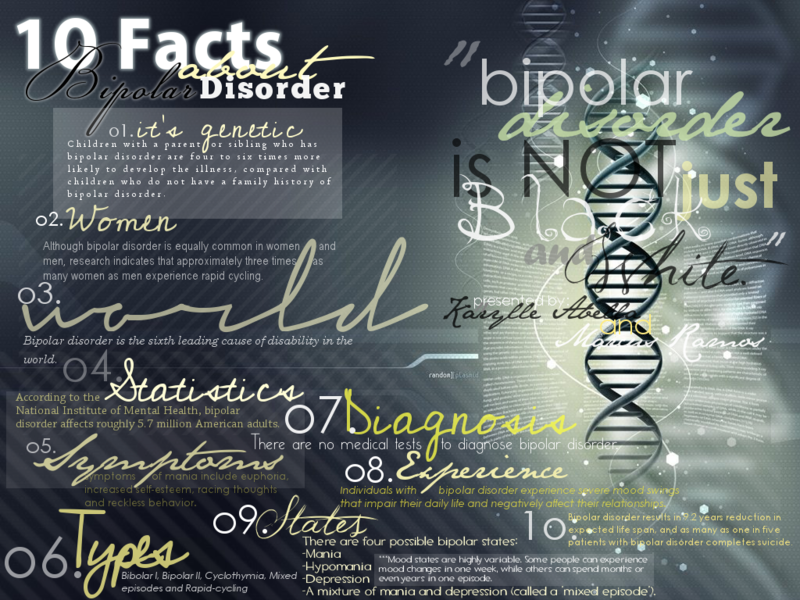 If I were wandering through a random space it would make me stop and want to learn a bit more about bi-polar disorder. For another unique poster check out the offering from Maya Gouw and Morgan Travis in the Hall of Fame. And finally, a Prezi from Trang Le and Dipatri Farkas. Admittedly there were several fantastic Prezis (Good job Imran, Zaine, and Srija) but this one brought everything together in a package that was BOTH beautiful and informative. ANGELMAN SYNDROME on Prezi Thanks for taking a moment to check out the work of these students. I am truly humbled by the level of work they continually produce.